Bike theft has become a common menace in cities, colleges and parking lots, which has made it hard for bike owners to trust leaving their bike in any of these places. You will leave your bike unattended for 30 minutes only to come back and find out that it is gone. And once it is lifted, chances are that you are never seeing it again. The best way to prevent this is by investing in a good bike lock. If you manage to get your hands on the best lightweight bike locks, you will be sure that your bike is safe since they are unbreakable, secure and easy to use. Investing in a good bike lock will mainly depend on security, convenience, and style. Given the right tools and enough time, even the most secure locks can be broken. Bike locks make more sense for low-medium value bike owners as they are easy to sell off once stolen. Before you decide on the bike, lock to buy it’s important to understand the different types of bike locks as this will determine the kind of bike lock you get. You will want to know the upsides and downsides of using the different types of locks. U-locks are lighter, a little bit easier to use and cheaper than their chain counterparts. They do all these and still manage to offer the same level of protection. Unlike chain locks, U-locks are rigid which makes it harder to transport them and their size limits the number of places/things you can lock your bike to. Chain locks mainly consist of a long chain that is usually covered by a sleeve in a bid to protect the paintwork. The chain lock will also have a big lock to secure your bike. Chain locks can be classified into two categories; there are the portable chain locks and there is the stationary chains, which are super heavy. The portable chain locks are easy to move around as you even wrap them around your seat post and use them when the need arises. The only problem with portable chain locks is that they are most 12 mm thick, which makes them easy to cut through. They might be heavier than U-locks but they are definitely less secure. However, when it comes to the stationary chain locks, they are arguably the best way to lock a bike since they are heavy, super thick and made from core-hardened steel. Since they are heavy, stationary bike locks are best used when securing your bike for extended periods. Folding locks comprise of metal plates that are linked together by use of rivets. The rivets are designed in such a way that they allows the metal plates to rotate thus allowing you to fold your folding lock into a tight package, which can be folded out when the need arises. Once fastened around your bike they form a stiff shape. Generally, folding locks are lighter than their U counterparts but offer the same level of security. They are more flexible and longer which gives you much options than your standard U-lock. Like earlier mentioned, folding locks fold down easily to make a compact package that is portable. While in the compact package, you can put it in a carrying holster that you can screw onto your bottle holder. Generally, cable locks comprise of numerous strands of thin long steel that are braided together and coated using a plastic tube. They are super light, cheap and definitely flexible. However, the flexibility aspect comes at a cost as it means that they can be cut with bolt cutters in seconds. And since every bike thief equips himself with a pair of bolt or cable cutters, your cable locks are less likely to offer much security. However, not all cable locks are flimsy; you can buy the armoured cable locks, which are better than your typical cable locks but not as secure as a chain lock or the best u-lock. 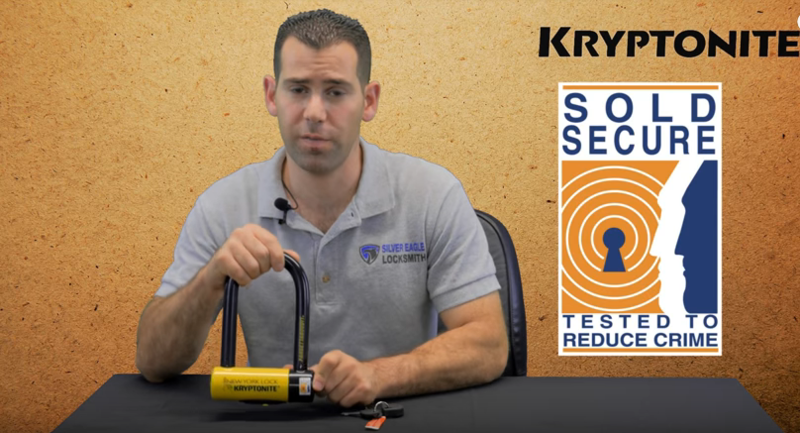 The Kryptonite Mini Heavy-Duty Bike lock is said to be one of the best u lock for bikes. It is boasts of a small build but it is quite heavy. Its shackle is made of hardened max-performance steel, which makes it hard to beat using hard tools such as bolt cutters. The heavy-duty bike lock features a patented steel sleeve for additional security. It is also has a top-notch disc-style cylinder that is said to provide the best security. The bike lock is coated with a vinyl coating and sliding dust cover to help maintain and extend the cylinder’s life. It has a key safe program and center keyway that is designed to protect your lock against leverage attacks. It is among the best bike locks for NYC. Despite being decent in size, the Abus Granit 540 is relatively light and it is said to be the best bike lock for city since it offers one of the highest levels of security. It features a 13mm shackle that is designed from a unique type of steel that is just as strong as it thicker and heavier counterparts. The Abus X-Plus 540 is best lightweight bike lock you will find that offers high security and still manages to have a practical size. Although the X-Plus 540 is not the cheapest bike lock on the market, its security and practicality makes it the best way to lock your bike. For over 40 years, Kryptonite has delivered some of the best bike locking technology. Each year they manage to make better and innovative locks that are harder to cut through and the Kryptonite Kryptolok Series 2 is no different. It is an affordable bike lock that offers mid range security. It should withstand all bolt cutters expect the very big ones. The Kryptonite Kryptolok features a 13mm shackles combined with a 4ft flex bike cable. The flex cable should help secure your bike onto objects that are thick. It may not offer the highest level of security but it is definitely easy to use and affordable, which makes it a good choice for low risk areas. This is one of the lightest folding locks and it offers solid security. It has a Silver Rating on Sold Secure. The Foldylock Compact is very practical as it unfolds to 90 cm. This means that it interlocking space is almost the same as that of a typical u-lock. However, unlike a standard u-lock the Foldylock Compact gives you more options when looking for a place to lock you mountain bike. It is the best bike lock for city. With this lock you will not have to contend with scratches and dings on your bike’s frame. This lock has 6 steel bars and links that are designed to protect your bike from thieves with hacksaws and bolt cutters. It is available in 3 colors green, cream and red. The TiGr mini bike lock takes on the U-lock design but with a few modifications here and there. Instead of rocking the usual u-shaped metal bar, TiGr lock rocks a 1.25” band made from titanium, which inserts into a cylindrical lock. The TiGr lock is super light as weighs less than 17 ounces. It has an 8” by 4” locking area, which is enough to secure your bike rack or bike. The overall design is appealing and easy to handle. As for the cylindrical locking mechanism, it is opened using a key and locked by push of a button. This is one of the best type of bike lock especially in cities or universities. Although most of these lightweight bike locks are rated as secure, they cannot secure your bike if left long especially overnight. You do not leave your bike overnight and expect to find it there; you are simply giving the thief enough time to do what they do best. Therefore, always secure your bike in an open place that is easy to spot from several locations. Otherwise, your bike lock might not be of much help.